Summary: The Sea Turtle Hospital includes 2 separate holding facilities that house FP turtles and non-FP turtles. The FP area has (3) 8 foot diameter tanks and (1) 12 foot diameter tank. The non-FP side has (1) 20 foot diameter tank, (3) 12 foot diameter tanks, (1) 8 foot and (3) 6 foot round tanks. The facility has (3) separate closed loop filtration systems and we make our own saltwater to supply each tank. Each area is covered by metal roof structures. This project will allow the purchase of additional equipment to help better care for sea turtles. Results: Brevard Zoo staff purchased all of the equipment outlines in the grant application. We were able to obtain better pricing for some of the items, so the final expenses shifted slightly and we did not spend the full grant award, which was deducted from the final payment request. 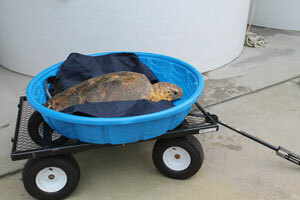 The equipment that the Brevard Zoo purchased has helped us rehabilitate sea turtles. The cart has been hugely beneficial in enabling staff to safely transport sea turtles for treatment while reducing stress. Moreover, the lamps and lab equipment are being used daily within the facility. The staff has been able to continue its work with sea turtles while collecting vital data that aids in the day-to-day treatment and monitoring.